OData Connectors from RSSBus (http://www.rssbus.com/odata/), a series of web apps that expose OData feeds (which then of course can be consumed in PowerPivot and SSAS Tabular) from a variety of data sources including Quickbooks, Twitter and MS CRM. 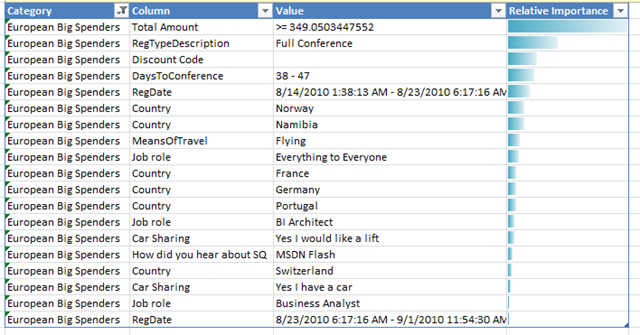 I’d seen the website a month or so ago, actually, but I found out today they are close to releasing OData connectors for Google, Google Docs, Facebook, Email and PowerShell as well, which open up some intriguing possibilities for PowerPivot analysis. I can imagine doing a really cool demo where I set up an email address, got the audience to email me, then hooked PowerPivot up to my inbox and analysed the emails as they came in! XLCubed (http://www.xlcubed.com/) – well, ok, they aren’t exactly new to me but it was good to have a chat with the guys on the stand. It’s worth pointing out they have a good mobile BI story for SSAS users. Kepion (http://www.kepion.com/) – I was quite impressed with the demos I saw of their products for building SSAS-based BI solutions, especially for (but not restricted to) financial planning; it looked pretty slick. Predixion (http://www.predixionsoftware.com/predixion/) – again, the company itself isn’t new to me but I got a demo of their new product, Predixion Enterprise Insight Developer Edition, which I’d been meaning to check out for a while. This is an immensely powerful free tool for doing data mining in Excel and it’s very closely integrated with PowerPivot too. Even if you don’t want to do complex stuff, it has some features that would be useful for regular PowerPivot users such as the ability to select a column in a PowerPivot table, analyse the data in it and then generate bandings which are then persisted in a new calculated column. From the familiar interface of Microsoft Excel, Excel DataScope enables researchers to accelerate data-driven decision making. It offers data analytics, machine learning, and information visualization by using Windows Azure for data and compute-intensive tasks. Its powerful analysis techniques are applicable to any type of data, ranging from web analytics to survey, environmental, or social data. You can use the Live Labs Pivot control for visualisation. It does data mining in the cloud. Is this the successor to the old data mining addin? The functionality is clearly the same. There’s a section on Map Reduce running on Windows Azure on one of the posters. Is this using Dryad? Is this a first glimpse of a new cloud-based BI platform from Microsoft? 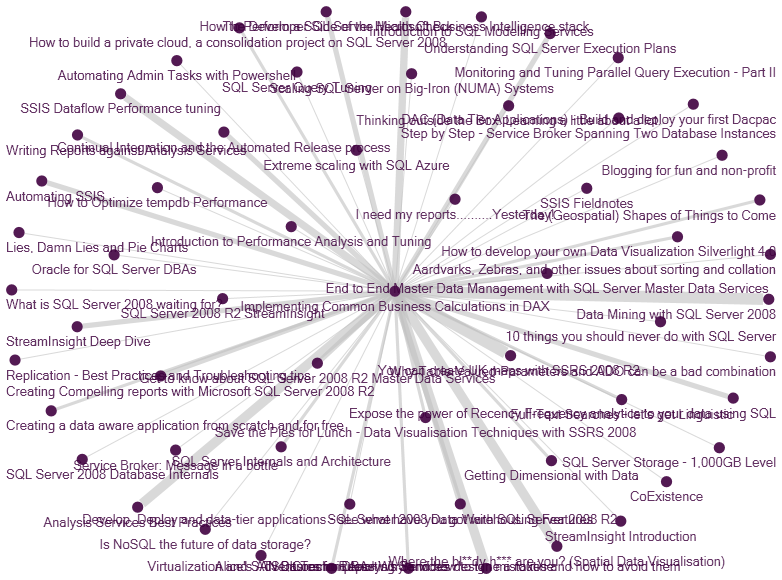 Will SSAS in the cloud form part of it? Before we all get too excited (or at least I get too excited) it’s worth noting that this is coming from the eXtreme Computing Group and not the SQL Server team, it’s clearly aimed at scientific rather than business users, and is described as “an ongoing research and development project”, ie it is not a commercial product. The potential is obvious though, and I hope it becomes something significant. a distributed, scalable infrastructure that supports inference in large-scale probabilistic graphical models. Basically a data mining app that can scale out across multiple servers; with a bit of imagination you could see how this could turn into data mining in the cloud, but we’re clearly a long way away from that happening. It’s ridiculous, really, that OLAP and data mining functionality have co-existed inside Analysis Services for years now yet they never seem to be used together. I only ever work with the OLAP side of things and just play around with data mining – I’ve never done a serious project with it, unfortunately – and from what I can see the people out there working with Analysis Services data mining don’t tend to use it with cubes; it’s two separate worlds. Anyway, to get to the point, while I was preparing for SQLBits a few weeks ago I came up with a simple idea of how you could use AS data mining to generate forecast data which could then be loaded into a cube, an approach that I think could be easily adapted for use in most real production systems. Now, having spent an evening in a Munich hotel room testing this out, I present my findings. This dimension then had a single attribute hierarchy with two members on it, Actual and Forecast. I then added a new foreign key column to my existing fact table so I could join the new Scenario dimension to it. This column always contained the value 1 because all the data in my fact table only represented Actual values. Next I created a new data mining model using the Microsoft Time Series algorithm based off my fact table. The Time dimension foreign key column was used as my Key Time column and the measure representing the number of postings was set to be an Input as well as Predictable. Obviously if you were doing this for real you’d want to spend a bit more time making sure your mining model was giving you good results. One thing I found in order to get this to work nicely was that I had to change the ‘meaningful’ surrogate keys on the Time dimension that Allan had provided me with (eg the key for April 30th 2008 was 20080430, May 1st 2008 was 20080501) to meaningless integer surrogate keys where each new day had a key value one greater than the previous day (eg April 30th 2008 was key 3043, May 1st was key 3044 etc). This meant that when I ran the above DMX query it returned surrogate key values for each predicted value that I could use with my time dimension – before I did this I found the DMX query just added 1 to the date key for each predicted date, giving me incorrect key values like 20080430, 20080431, 20080432 and so on for April 30th, May 1st, May 2nd and so on. Added a derived column with the value 2, as the foreign key for my Scenario dimension, to show that this was all Forecast data. 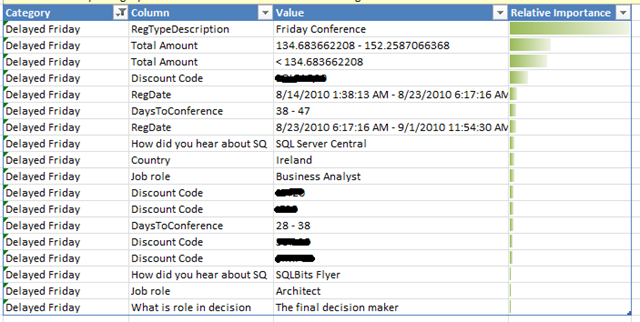 Used a data conversion transform to convert the two columns returned by the DMX query from bigints to ints. Used an OLEDB destination to load the data into a new Forecast fact table (with a structure identical to the existing fact table) in SQL Server. You’re not going to want to (or probably be able to) use the Time Series algorithm at the granularity of your fact table. It might make sense to use it at Day granularity, but you’d probably want to aggregate your other dimensions up to a much higher level (for example aggregate from Product to Product Category, Customer to Country and so on) and then generate the forecasts. This would mean in turn you couldn’t just create a new partition in your existing measure group to hold the forecast data, you’d need to create a new measure group. However with some simple MDX you’d be able to integrate the two sets of values and get a similar result to the one I’ve achieved here. You’d want to automate the training of the data mining model, and this can be done pretty easily in SSIS using the Analysis Services processing task. You might want to store the set of forecasts you generate each day, so you could compare different forecasts made on different days or compare an old forecast with the actual data that subsequently came in. To do this you’d need to add a new dimension to your Forecast measure group which would be Forecast Date (ie the date the forecast data was generated), and maybe make your forecast measures semi-additive (eg last nonempty) with regard to this new Forecast Date dimension. As I said, you’d want to spend a lot more time than I did making sure your data mining model gave you good predictions; the aim of this blog entry is to describe how you’d load the forecast data into AS, not make sure the forecasts were accurate! Trying to forecast 1.5 years into the future as I did is probably a bit optimistic; it might be better to limit your predictions to a few days or a month. I used AS2005 here but AS2008 has got a much improved Time Series algorithm you can find out about here. 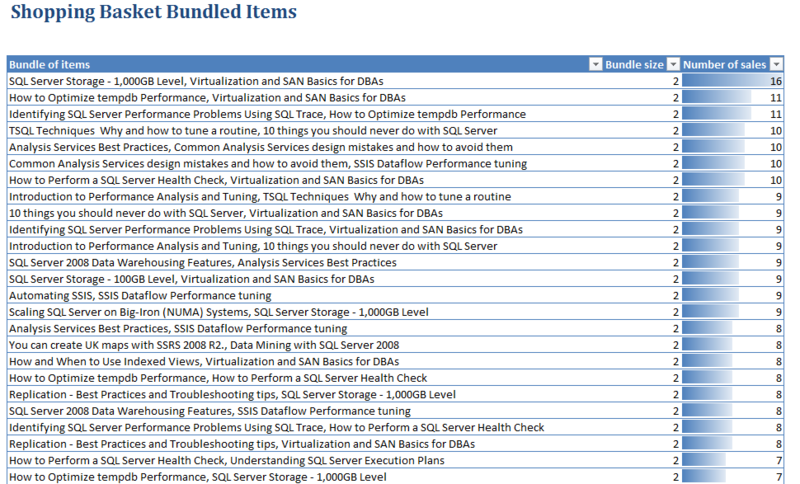 And if you want to learn more about AS data mining your starting point should be www.sqlserverdatamining.com; I see also that there’s a 2008 version of the DM team’s book out soon too – I liked the 2005 version and it was certainly a lot more helpful than BOL for understanding all this. So overall a fun exercise and one I might work up into a presentation for a user group meeting or something similar. I’d be very interested to hear from anyone who is doing this for real though, to find out how well it works in practice; if I get the chance to implement it with one of my customers I’ll blog about it. And wouldn’t it be cool if, in the next version of Analysis Services, you could automatically add a Forecast partition to your cube in BIDS and have all this work done for you through a wizard?